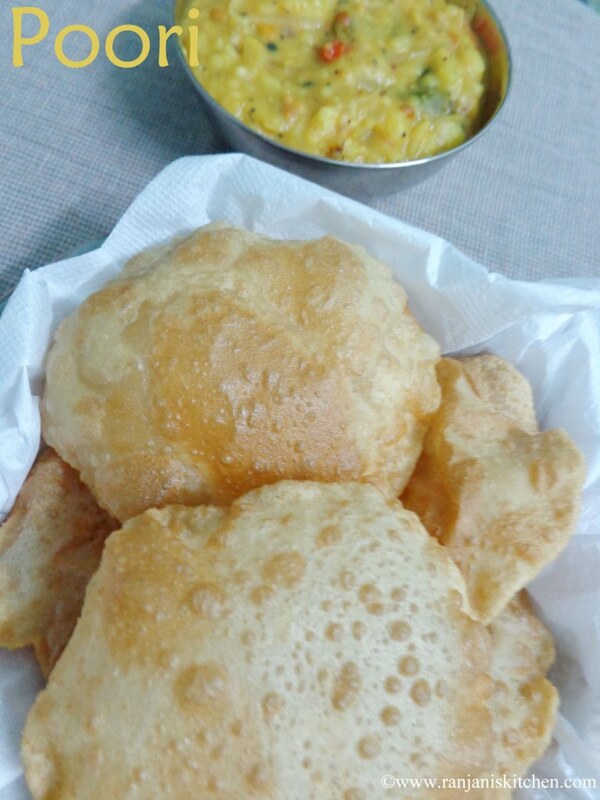 Poori/Puri!! A common indian breakfast served at special or ceremonial rituals along with other vegetarian recipes.I usually prepare poori’s when we have guest at home but not frequently.In my childhood days , amma makes it in special occasions or Sundays. So always it’s a treat to eat. May be rarity makes it very special 🙂 . Once I had poori with channa masala and some other gravies. But I love Potato Masala to the core.While I thought of posting this poori recipe, I planned to post the final picture alone. Never thought to post the steps 🙂 .I wonder how to take snaps while fluffing.Hope it came out 😉 is it?. Now off to the recipe. Take 1 cup of wheat flour in a bowl, add salt and mix well. Now add water little by little and make a dough. Finally grease oil in hands and give a finishing in dough. Let it sit for ½ an hr.Then divide equal proportions and roll. 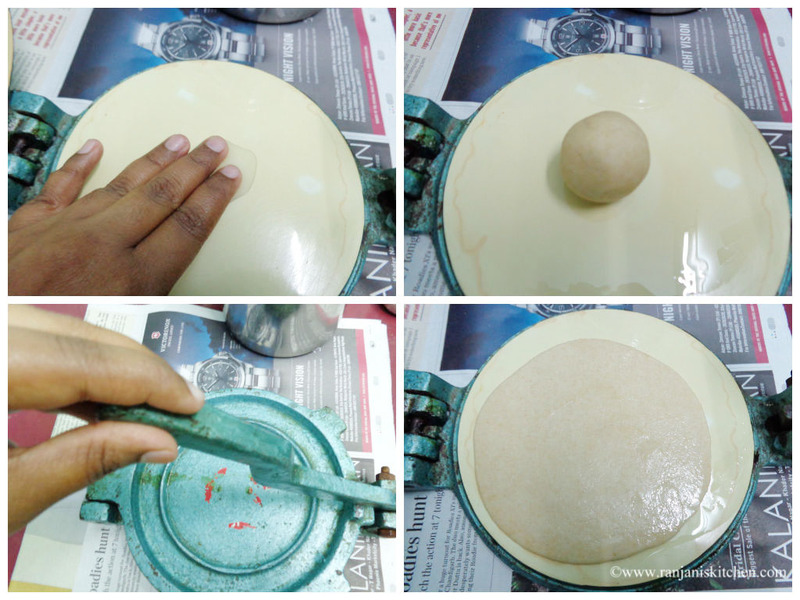 I used Poori maker, you can normally use the roller. Apply oil or dust with flour while making poori’s. Heat oil in a pan to make poori’s. Make sure the oil is enough to immerse the poori.Once the oil is heated,keep it in low flame and drop the poori one by one. Cook on both sides to golden color. Now the hot and fluffy poori is ready to serve with potato masala. You can add hot water to make the dough. Adding oil in dough is completely optional. I added to avoid stickiness.Moreover which makes the dough soft. After dropping poori in oil, press in center using spatula.Then turn on other side. 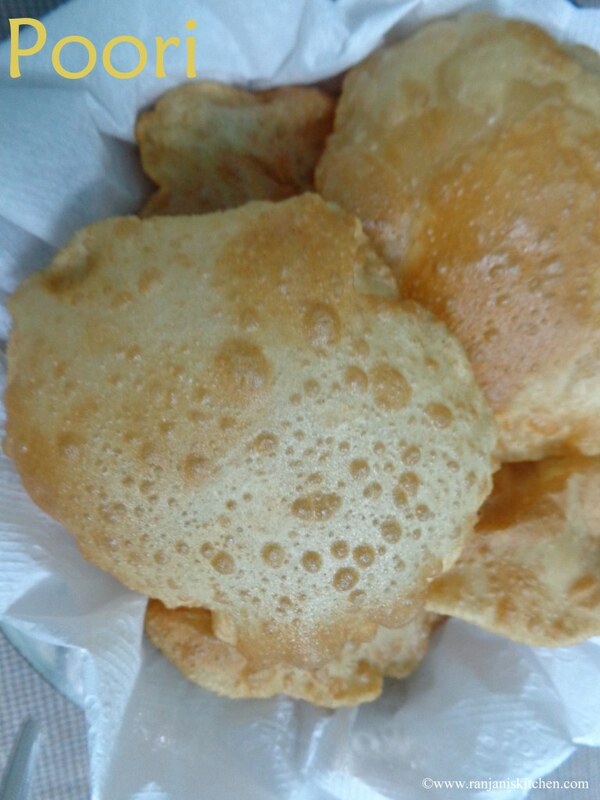 For crispy poori’s as in restaurant’s you can add 1 tsp of rava while making dough. Looking nice and fluffy puri’s!! !